Specificity This antibody specifically interacts with the pThr - Glu - pTyr motif of activated MAP kinases 1 and 2 (erk1/2). The antibody requires phosphorylation both at the threonine and the tyrosine site and does not interact with the non-phosphorylated form of the protein. Mab MAPK-12D4 shows no crossreaction with activated SAP kinases 1 or 2. 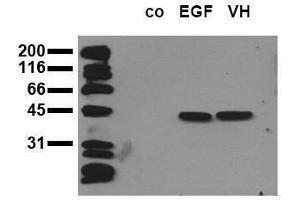 Application Notes Western Blot: 0.5 μg/mL for HRPO/ECL detection. Recommended blocking buffer: Casein/Tween 20 based blocking and blot incubationbuffer. Positive Control: Cell lysate from pervanadate-treated HepG2 cells. ELISA: 0.05 μg/mL. Immunoprecipitation: 1 - 10 g per 10^6 pervanadate-treated A431 or HepG2 cells. Immunocytochemistry: 1 - 10 μg/mL. Immunohistochemistry on frozen sections. Reconstitution Restore with 1 mL H2O (15 min, RT). Storage Comment Store lyophilized (preferably in a desiccator) at -20 °C and reconstituted (aliquote andfreeze in liquid nitrogen) at -80 °C. Avoid repeated freezing and thawing. Thaw aliquots at 37 °C. Thawed aliquots may be stored at 4 °C up to 3 months.